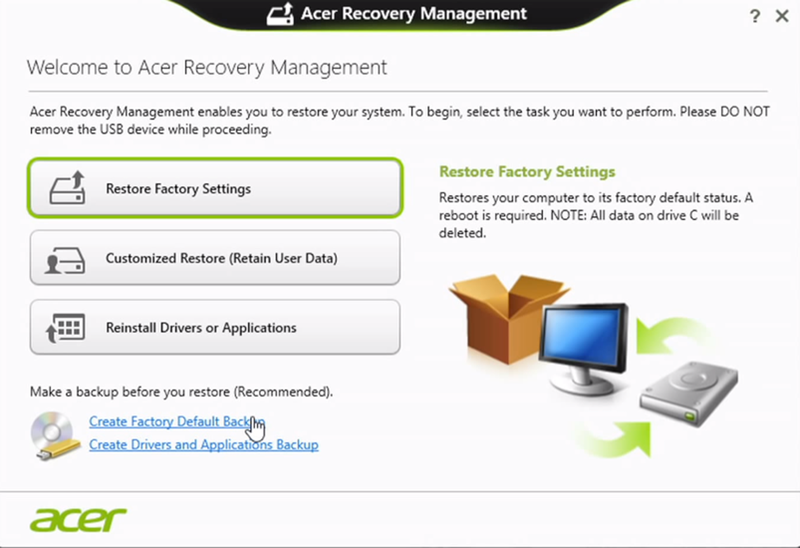 Brief introduction to Acer eRecovery Management in Windows 8. In general, Acer eRecovery Management Win8 is Acer eRecovery Management in Windows 8. It is very similar to Acer eRecovery Management Windows 7 and Acer Recovery Management Windows 10. They have almost the same functions but with different interface. Like any other Acer eRecovery Management, may Acer eRecovery Management Windows 8 not working sometimes for some reasons. See details below. AOMEI OneKey Recovery is a third party program aimed at operating system backup and restore. Before accidents happen, you can make use of it to create system recovery media (partition, discs, USB, etc.) based on current healthy OS and save the media in safe place. After accidents happen, you can immediately get your system back by restoring from the media. Professional Edition: Support Windows PC systems. Server Edition: Support both Windows PC and Server systems. Technician Edition: Special designed for technicians to provide technical services to their PC or Server clients. Customized Technician Edition: This is the highest edition of AOMEI OneKey Recovery. It functions like Technician Edition but further enables customers to change the logo, GUI, interface, text, etc. of this software. If your Acer eRecovery Management is unavailable, you can sure get AOMEI OneKey Recovery and let it continue to protect your PC or Server.